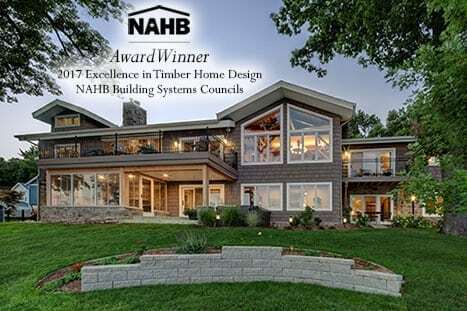 A home designed and produced by Riverbend Timber Framing of Blissfield, Michigan, was honored at the Jerry Rouleau Awards for Excellence in Home Design, hosted by the National Association of Home Builders’ Building Systems Councils. “The Kalamazoo Residence,” a custom, waterfront timber frame home received the award for Excellence in Timber Frame Home Design in the 3,000 – 4,000 square feet category. The 3,600 square foot home was designed by Riverbend’s in-house design group. 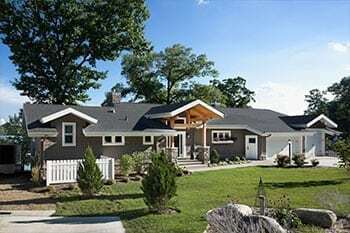 The timber frame structure was produced by craftsmen in their Blissfield shop and assembled by a Riverbend crew on the home’s site, located about halfway between Kalamazoo and Battle Creek, Michigan. This is the third year in a row that one of Riverbend’s homes has been honored by the Building Systems Councils. 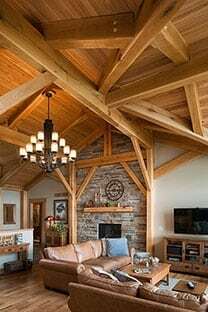 ABOUT Riverbend: Riverbend Timber Framing is a designer, producer and builder of traditional, mountain, barn, cottage, and waterfront timber frame homes for clients across the US, Canada and around the world. Riverbend is part of PFB Custom Homes Group, LLC which also includes additional brands, PrecisionCraft Log & Timber Homes, M.T.N Design, Point Zero Homes and TimberScape.